I’m sitting here typing on a phone, wearing an inflatable, lavender hospital gown with hot air being pumped in. I look like a purple sumo wrestler. I also have an IV, and they gave me a few drugs that have left me slightly groggy. The dr is late because he is deli wrong – ha ha- auto correct – delivering a leap day baby. I feel good about the surgery and I really do think this is the right path for me. I have been promised good drugs and I’m supposed to be home tomorrow night provided all goes well. They have briefed me on everything and the only thing left to talk to the dr about is if he’ll put my uterus in a jar for me to look at after. That’s all for now. Today we are going to look at a few great Augason Farms products, as well as some recipes that will go beautifully with your food storage! Beans are the food I’m featuring today, and although there are a million excellent recipes calling for beans, I’m going to show off two of my favorites. Legumes are a food storage staple. They are loaded with nutrients and can be prepared as a meat substitute for many meals. 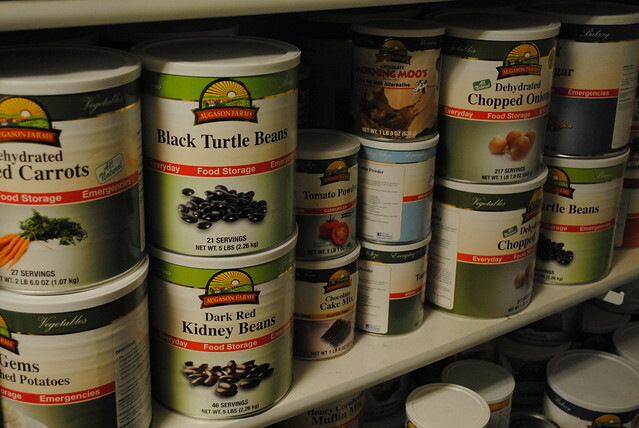 a solid food storage has a good supply of legumes! When I hear the word beans, the first place my brain goes is to my chili recipes. 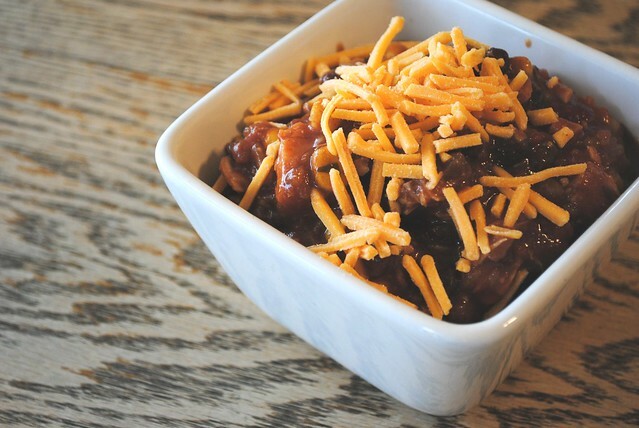 Chili is perfect for a cozy mid-winter night and great in the summertime slathered over a hot dog or drowning a fry bread taco in flavor. Chilies almost always make for great freezer meals as well, and are easy to make ahead of time and store for situations when you just don’t have the time or energy to cook, such as preparation for a surgery or new baby or a particularly busy season at work. So let me share one of my favorites! 24 0z. (3) boneless skinless chicken breasts, left over chicken or canned chicken if you are going pantry only. This is a very simple recipe- dump it all into a crock pot and let it simmer until it is hot and blended together. I like to serve it over Augason Farms Corn Bread. YUM! Now, we need some chocolate to go with that super yummy chili. Did you know that if you eat something too spicy and need to fix that burning sensation chocolate is a guaranteed fix? It is the best natural remedy out there! Augason Farms has a great brownie mix (and it is on sale right now as part of the Valentine’s Day sale). 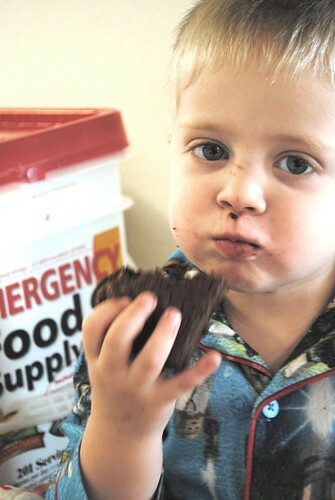 I know you may be asking why I keep “junk food” in my food storage. 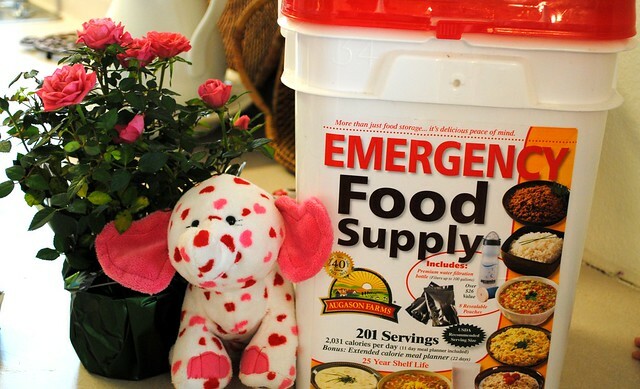 Isn’t food storage just beans and rice and essentials so we don’t starve to death? Well, yes. That is obviously the first priority. 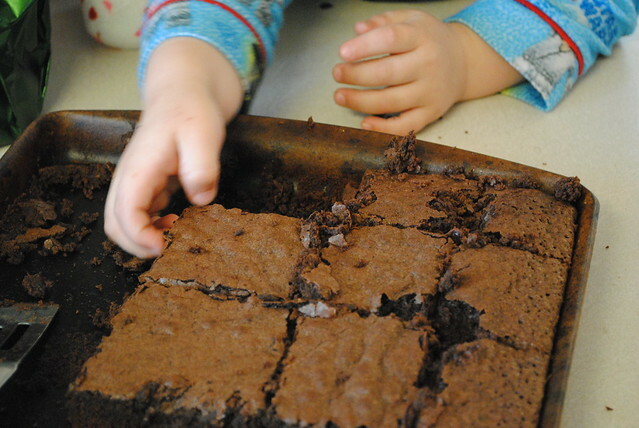 However, comfort foods can make a huge difference in morale, and a chewy brownie can be a very soothing treat in a time when food is scarce or resources are tight. Plus, you can make brownies healthier by adding black beans. Yes, you read that right. They will be lower calorie, lower sodium, higher protien and fiber- and they’ll be CHOCOLATE! Rinse the beans. Put the beans back in the can and add enough water to cover beans. Puree the beans and water until they are a well blended paste. Add brownie mix to black bean puree and mix. Cook in greased 9 X 9 baking pan. Bake brownies according to package directions. You will probably need to bake them a little longer- just test them with a toothpick to make sure they are cooked through. Makes about 20 super yummy brownies. Now, I want to show you a really great new product Augason Farms has come out with. They have these new emergency pails that contain enough food for one person for 11 days as well as a self filtering water container. These are perfect for emergency situations, 72 hour kits (we have 2 as part of our family’s 72 hour kit), camping or quick and easy on the go food situations! They also just came out with a larger version (I so want this! And it is on sale right now!) that has enough food for 30 days. Get one for each family member and you have an instant one month supply for your whole family, complete with cooking instructions and suggestions. And, yes, it has a 25 year shelf life, so once you have your buckets, you are good to go for a quarter of a century. In honor of Valentine’s Day, and in connection with Augason Farms, I am giving away one of the 4 gallon buckets, as pictured in the the photo above. This is a $75 value and I can’t wait to send it off to one lucky, lucky reader! You have three chances to win. 1) Leave me a comment right here. Easy-peasy lemon-squeezy. 2) Go LIKE Augason Farms on Facebook! They like you, so go like them back! 3) Tweet, Facebook or Blog about this give-a-way and link back to this post. Drop me a comment for each entry, and I will randomly draw a winner on V-day! 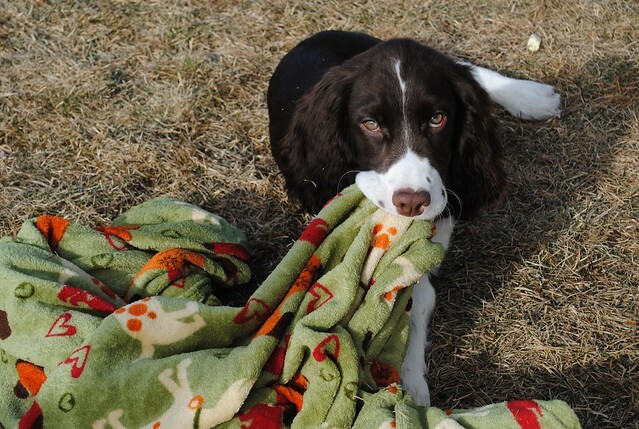 Watson got a new blankie today. This one was $3.98 in an after Christmas clearance bin at PetSmart. As soon as we unrolled it, he grabbed it and ran outside with it to rejoice in the newness and make sure it got covered in yard smell. 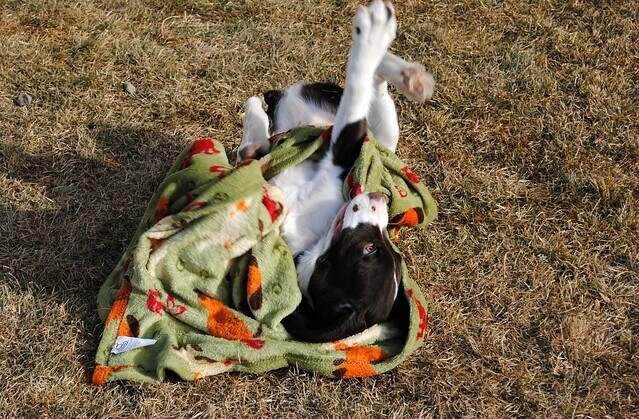 He was a wild dog, twisting and flopping and fighting that blankie to the death! He also used it to play what most people would call “tug of war” with Gabriel, but since they are both at the developmental age of a toddler, we just call call the game “MINE! No, MINE!“ Look at those ears fly. I’m reminded of a song by Willow Smith. . .I whip my ears back and forth. I whip my ears back and forth. Cute kid, somewhat annoying song. Now it’s in my head. Of course, it really is Watson’s. 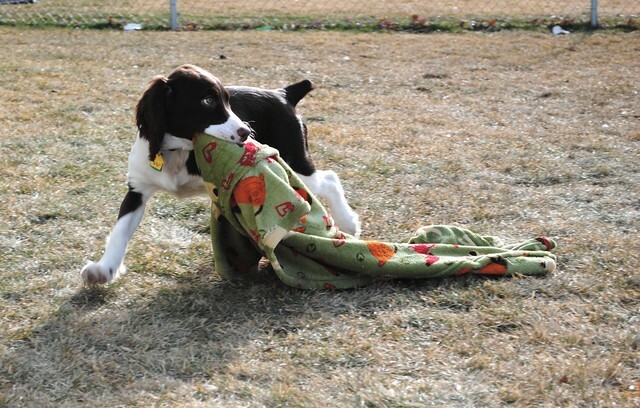 He makes a cute little Linus carrying around his blanket, don’t you think? 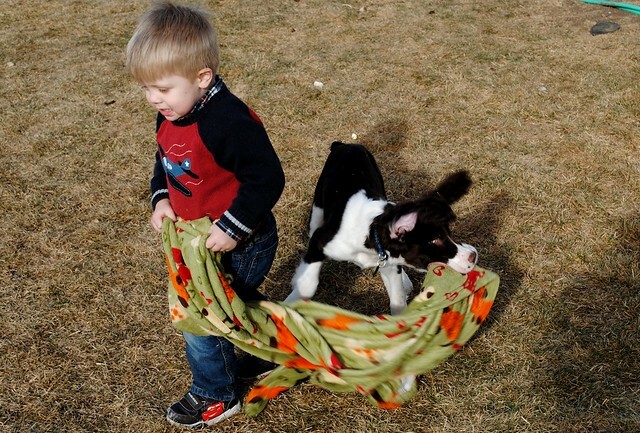 Who knew two yards of fleece could have him so excited? Also- note the brown, brown grass and the no snow. This is January in South Dakota. I have my windows open and air flowing through the house because it is WARM outside. This is so weird. My kids think it is spring- but I assume we will get hit by something fierce come February. Until then, it is puppy training bliss out in the nice warm sun. Bird dog. 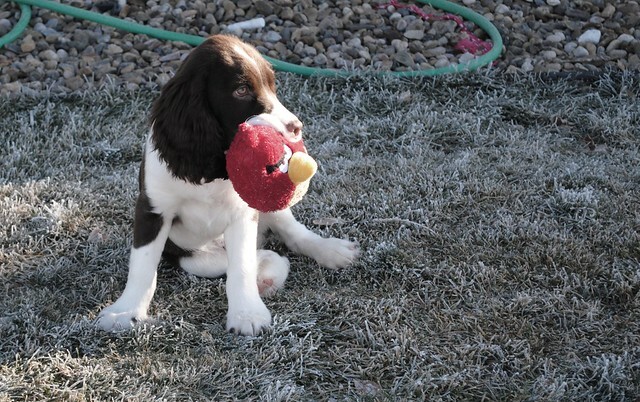 Angry bird dog, that is. 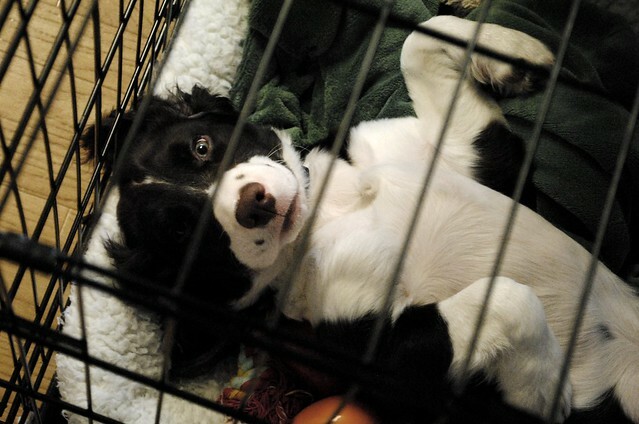 We have been careful to keep his kennel at a comfortable, but not too large size so it would help with potty training by exploiting the instinct not to soil the den. So far, it has worked well. He only tinkles a bit from excitement and not from, “Oh gee, this looks like a great place to relieve myself”. 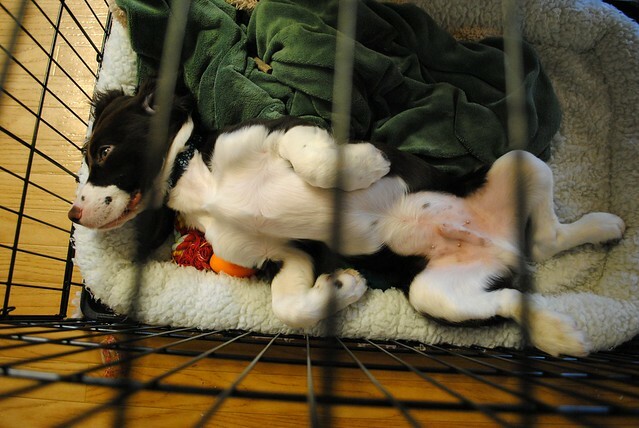 For such a young pup (15 weeks) he is actually doing pretty well with the housebreaking. (I have to keep telling myself this because I loathe potty training humans and dogs and want it over with yesterday). We realized he might need a little more space yesterday, so when I cleaned out the kennel, I removed the divider, figuring I could just put it back in if it became an issue. I don’t think we have a problem. I walked into the room earlier today and found Watson completely sacked out, ears flopping out of one end and puppy toes pressed against the other. He was so relaxed that he hardly budged when I grabbed the camera and got in his face to take photos. Dude was comfortable and staying that way. I think he likes his little den. This is Watson. He’s a hunk-a hunk-a puppy love. He looks adorable in this photo. This is what he usually looks like. 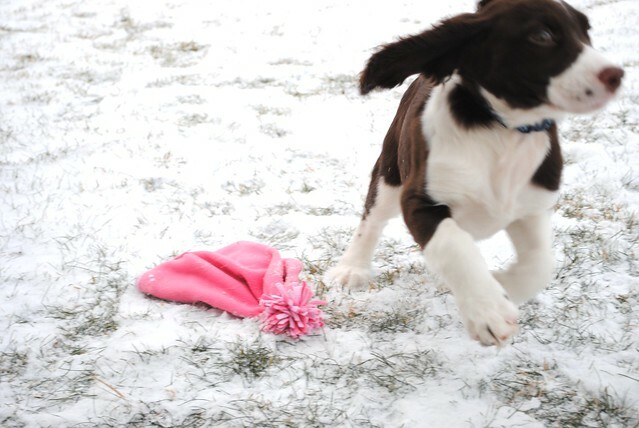 A liver and white blur. A very enthusiastic, bouncing, running, curly ears flapping in the wind kind of wild pup. 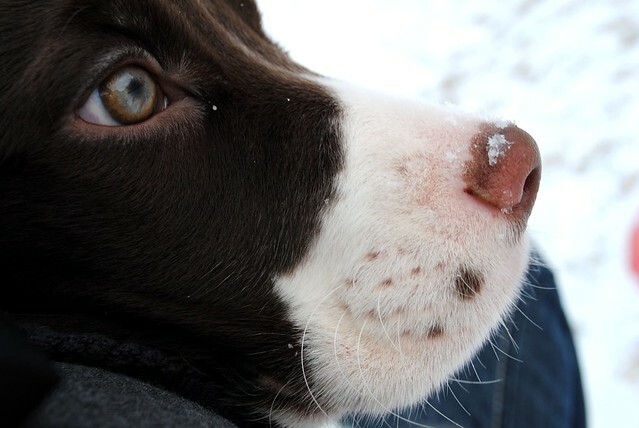 Also, he has a cold nose. With snowflakes. And people eyes. How do you not love a squishy-face like that? We were asked if we would like to participate in a special oral hygiene experiment for three weeks with our kids where we focused on brushing, flossing and rinsing twice each day. Our usual habits aren’t horrendous, but we could definitely use improvement, so we agreed. We have tried really hard to get our kids to practice good dental care. Chris and I don’t have an issue with it- frankly, I feel gross if I don’t brush twice a day, so my teeth get their fair share of attention. So does Chris’ mouth. The kids, on the other hand, have a completely different story. I am confident that they could go a week without using a toothbrush and not even notice until their mother passed out from horror at the unsightly sight of their icky smiles. They need constant motivation to brush and brush well. We have the same conversation every, single morning. I’m just glad I’m past the stage of having it be a huge fight. Jonas hated brushing so much when he was little I had to hold him down and pry his mouth open to clean his teeth. Trying to adequately take care of him felt like child abuse they way he carried on over it, and thanks to total non-compliance, he has had the most cavities out of the three. Maggie was reasonable about the whole thing. The youngest? Gabe has been an absolute pleasure. Because I didn’t want him freaked out about dental care, the very first teething “toy” I gave him was a toothbrush. He loved biting them, and we never had a single issue about brushing. In fact, he asks to have his teeth brushed multiple times every day and actually likes toothpaste. It’s a little weird, but he has great teeth! Listerine sent us a care package to help motivate the kids and they gave us several bottles of mouthwashes (including ones with fun characters and alcohol free varieties) as well as Reach toothbrushes. The kids were very excited to get going, Gabe with Batman stuff, Maggie with barbie and Jonas with his Phineas and Ferb collection. It was actually kind of funny because when the bigs arrived home from school and saw all of Gabe’s awesome hygiene paraphernalia, they were insanely jealous. You would have thought Christmas came early when I gave them their stuff. So we are on our way, hopefully developing better habits with the kids! Will update in a few weeks! Meet Watson! This little guy is the newest addition to the Killian family. 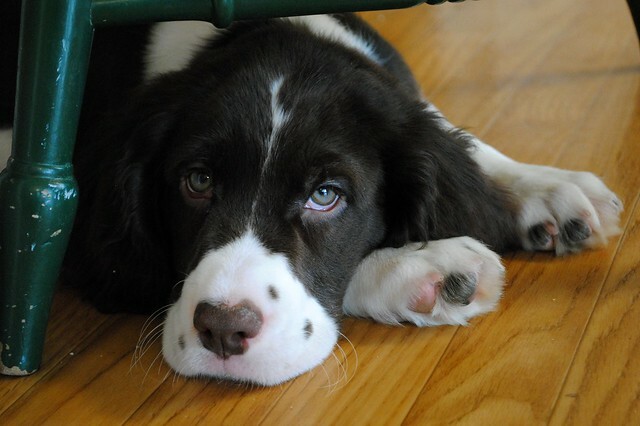 He is a liver and white English Springer Spaniel. 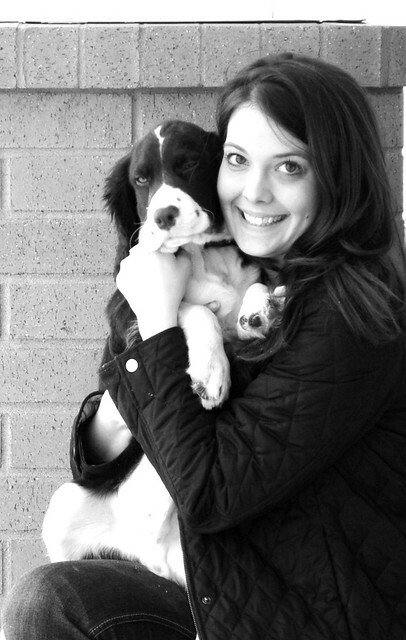 I love Springers! I had one growing up (Lizzie, best dog ever) and loved her to pieces and she was amazing, so this little guy has some big paws to fill. He is three months old, and so we are in the thick of puppy training, convincing him that potty goes outside and chewing is limited to his toys and not my stuff, face or fingers. So far, he is really pretty well behaved for a puppy. 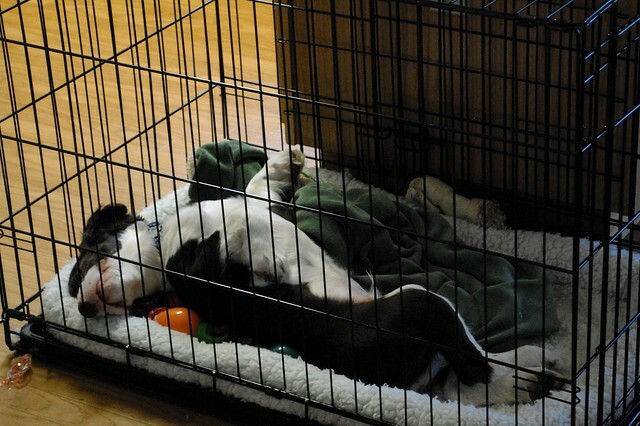 We kennel train, and he is pretty comfortable in his kennel- minimal whining during the day, and no whining at night. He is also very good about not soiling his kennel, so we are on the right track. 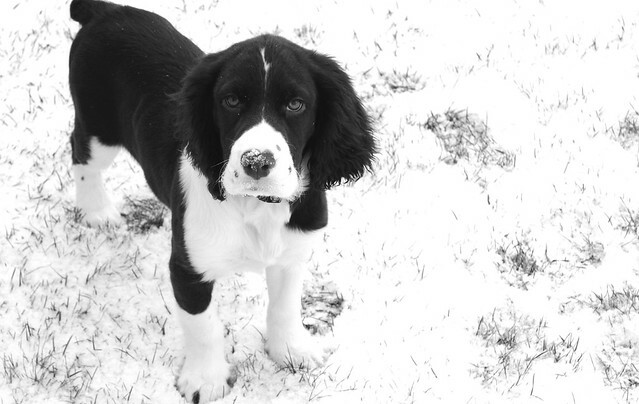 We had looked for a springer for quite some time when I came across his puppy picture online. It felt right so we went ahead and started arranging for him. The only challenging thing was that Watson was located six hours from us, near Sioux Falls, SD! We planned a long day trip for after Thanksgiving, and then Chris called and told me that he was being sent to Sioux Falls overnight to do Honor Guard services at a funeral. SCORE! We were able to work it out for Watson to catch a ride home with the Honor Guard, so we got our little guy Wednesday night, right before Thanksgiving. It was a scramble to get everything we needed for a puppy in two days! His first day at home was eventful. I’m sure between the roasting bird and the extra people he was pretty excited. We had our good friends, the Davis family over for turkey and fun, so they got to know Watson and helped name him. Now Watson gets to see their oldest daughter every morning at Seminary, so I am pretty sure he thinks she is a part of the family. Watson likes the kids, but he is very attached to me (probably because I fill the food dish, take him outside and spend the most time sitting here with him right by me). I’m sure as he gets older and more confident he will realize how much fun the kids are. He has one really weird quirk. He barks to get his water dish refilled, and flings it around the room with his paws. I have got to get that on camera one of these days. It is annoying, but hilarious. So that’s our puppy! I have to take him outside now, so best run! 5 Comments on Elementary, My Dear Watson!